Maldives at Landaa Giraavaru, Republic of Maldives, 2013-11-19 — /travelprnews.com/ — Located on the southeasterly edge of the island, away from the hub of the Resort, the chic new Three-Bedroom Landaa Estate at Four Seasons Resort Maldives at Landaa Giraavaru accommodates families or groups of six adults and up to five children across 2,000 square metres (21,500 square feet) of private quarters and grounds – the biggest and most impressive in the Maldives. Within the Estate’s traditional coral walls extends a vast beachfront haven with a flowing indoor-outdoor design: unobstructed ocean views combine with a massive sense of space, large sandy frontage, and wall-less living accommodation to bring the outdoors in and fully immerse guests in the absorbing beauty of the surrounding Baa Atoll UNESCO World Biosphere Reserve. A 25-metre (82 foot) swimming pool lies adjacent to a private 80-metre (260 foot) white sandy beach that gently slopes into the turquoise lagoon. Around the pool, a meandering deck links the living and bedroom accommodations with multiple terraces and outdoor seating, dining and relaxation areas – furnished with sofas and loungers, plus day beds on a “floating” platform. Beyond the deck, just a few steps into the sea, guests find themselves in the vibrant underwater world of the Baa Atoll, declared a World Biosphere Reserve in 2011 on account of the unparalleled richness of its marine life. Throughout the Estate, traditional Maldivian construction melds with contemporary design and furnishings in light airy interiors. In addition, an abundance of idiosyncratic features wow at every turn: from the second-floor plunge pool that cascades via a dramatic wall of water into the main swimming pool, to the upper Stargazing Loungecomplete with comfy sofas and powerful NexStar telescope with computer-automated technology. The expansive ground floor accommodation opens via a bright spacious hallway onto an open-plan living and dining room, flanked by a sleek kitchen and adjacent maid’s room. Two ground-floor bedrooms include a stunning master bedroom – complete with lounge and dressing area, plus huge en suite bathroom with sunken marble bath and pretty shower garden – and an en suite twin bedroom with lounge and dressing area, and large en suite with shower garden. The third en-suite bedroom – with double bed and state-of-the-art facilities including Bose surround-sound music system – is located on the second floor. Pastel blue, cream and whitewashed furnishings exude a relaxed yet sophisticated beachfront vibe, while all rooms offer uninterrupted floor-to-ceiling views across the sparkling lagoon. The second floor of the estate is also home to an upper Stargazing Lounge. Here, a large al fresco lounge area and covered plunge pool, sheltered by the Estate’s rooftops, offer wide-reaching sea views and the perfect location for sunset cocktails or night-time stargazing. Available round the clock to help epitomize a home-from-home experience, the Estate Manager can help arrange a poolside or beach dinner, schedule the day’s activities, or chauffeur guests around via their own private buggy. A personal chef is available to prepare delicious family breakfasts, while each evening hand-delivered cocktails and canapés provide the perfect accompaniment to sunset. Excellent snorkelling can be found just steps off the private beach (walled for additional privacy), while complimentary bicycles for every guest enable leisurely exploration of the wider island. For reservations, contact Four Seasons Resorts Maldives at (960) 66 00 888 or reservations.mal@fourseasons.com or book online. 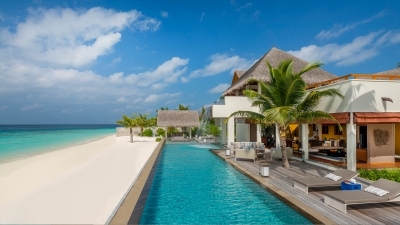 This entry was posted in Beach Holidays, Hospitality, Hotels, Luxury, Resorts, SPAs & Wellness, Villas and tagged Four Seasons Resort Maldives, Juliana Ang, Landaa Giraavaru, maldives, Three-Bedroom Landaa Estate, über luxe hideaway residence. Bookmark the permalink.